The head of Irish Jewry has defended the columnist fired from the Sunday Times this week after writing that Claudia Winkleman and Vanessa Feltz were paid well because they were Jewish. Maurice Cohen, chair of the Jewish Representative Council of Ireland, said Kevin Myers was not an anti-Semite, arguing that he was “well-respected” and that his writing style was “idiosyncratic”. 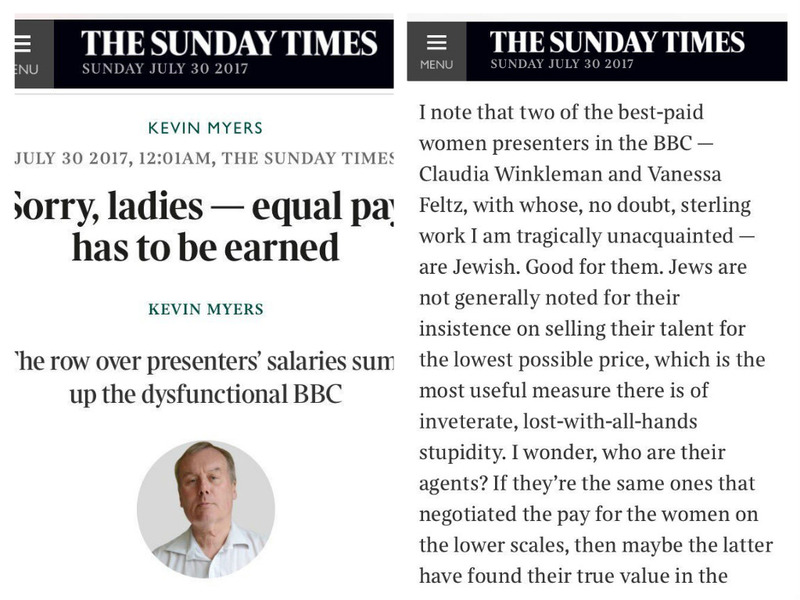 Myers’ article in the Sunday Times’ Ireland edition about the gender pay gap at the BBC, titled ‘Sorry ladies – equal pay has to be earned,’ caused outrage after he suggested that the two BBC stars only topped the pay list because of their ethnicity. 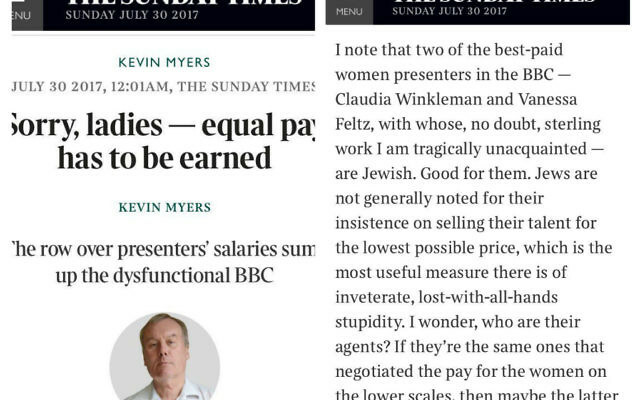 Myers was quickly sacked and the Sunday Times apologised to both women, but on her breakfast show on BBC Radio London, Feltz asked how the article was published in the first place, saying it portrayed “every vile stereotype”. Myers has repeatedly written in defence of Israel, and has argued that “no other people in history has done more to benefit mankind or enrich our common civilisation than the Jews,” but this week the Campaign Against Anti-Semitism said his past writing had included a questioning of the Holocaust. Cohen, however, rubbished the idea that Myers was either an anti-Semite or Holocaust denier, saying that to brand him as such was “an absolute distortion of the facts”. Arguing that Myers had “inadvertently stumbled into an anti-Semitic trope,” Cohen said: “Kevin ought to have known that his bringing the religion of the two BBC presenters into his writings on Sunday would cause concern and upset and that it was both unnecessary and bound to be misunderstood. “But the larger picture is that Kevin, who up until now was a respected columnist, has a particular curmudgeonly, cranky, idiosyncratic style. Myers has been approached for comment.